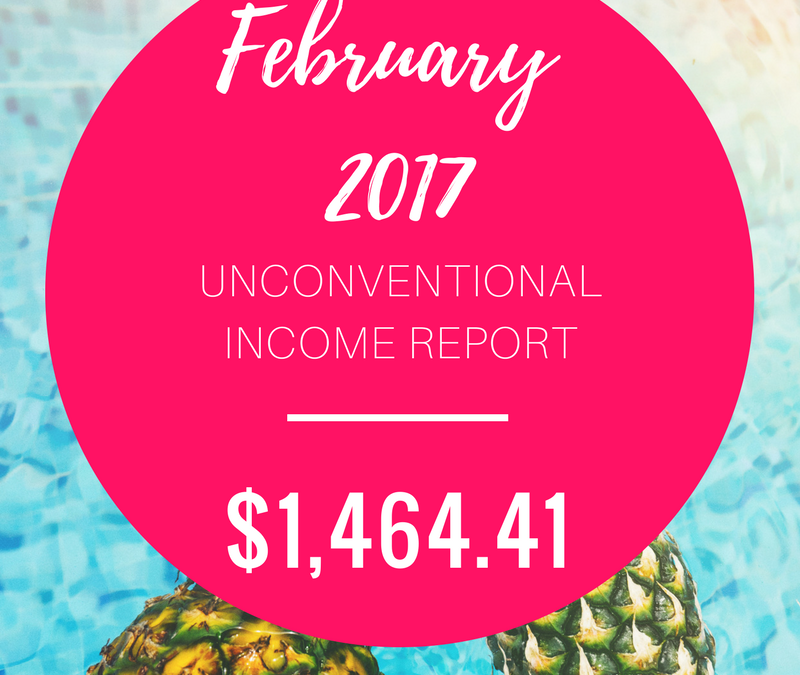 It’s month two of income reports! I know, I know, I’m only about 6 months behind… haha! But hey, better late than never, right?? First things first…. let’s address the elephant in the room. My income went down. Like, way down. In fact, it was cut almost exactly in half compared to January. Whoops! Okay first off, February was a short month, so there were fewer days to earn money. This was also the month many of my tutoring students had midterms, so I was working overtime in the evenings & spending less time on nutrition-related stuff. I spent a lot of time in February doing things that didn’t directly result in any income, but had the potential to bring in money in the future. More on that below! 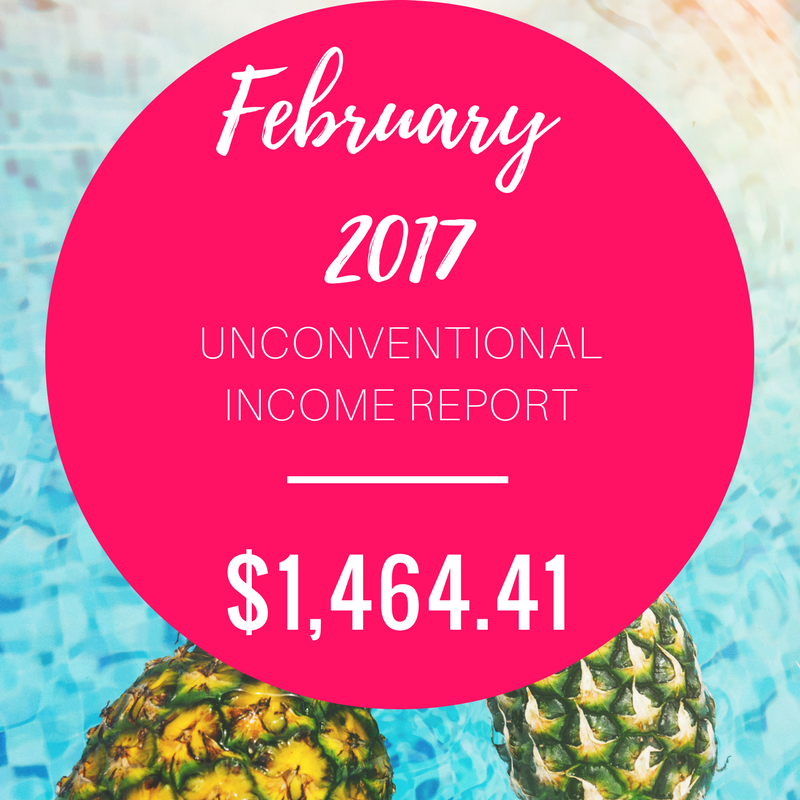 So the biggest reason my income dropped in February was because I saw fewer 1:1 clients. No surprise there, since that has been my primary source of “unconventional” income. 1. Nutrition Counseling ($675) – This month my client load was cut in half, and I was only working with 4 clients. Most of these were clients that were tapering off from before the holidays, so I did only two 1-hour appointments, and the rest was weekly email support. But, even though my client load was tapering off, I was also building up my pipeline for March, and had already ordered test kits for 4 new LEAP clients that would start working with me the following month. 2. Consulting ($612.57) – As previously mentioned, I was able to land a freelance gig rewriting a school district’s Local School Wellness Policy (one of the final rollouts from the Healthy, Hunger-Free Kids Act of 2010). Most of this work was remote, basically researching the new guidelines and writing writing writing. (So right up my alley!) Yay, working from home! 1. Tests without appointments ($100) – This month I had one client order a Spectracell micronutrient test without booking a follow-up appointment for interpretation. This wasn’t the intention, but things came up and we had to postpone the appointment! 2. Supplements ($43.22) – In February, I had still not signed up for Fullscript yet, and was doing the ordering and shipping of supplements for clients by hand (ordering directly from each manufacturers website through the practitioner portal, and having the product shipped to my clients). It was a lot of work! And not to mention tough to keep track of… I highly recommend signing up for a Fullscript account to manage your supplement recommendations if you haven’t yet done so! I earned a teensy bit of “passive” income from the ads on my blog this month. Just like in January, Gourmet Ads brought in roughly 5x more income than Google Adsense. If you’d like to learn more about the possible ad networks you can sign up with, read this article. If you’re trying to decide whether ads are right for your site, read this article. 1. Gourmet Ads ($27.03) – I think the reason Gourmet Ads earns so much more than Google Adsense is because I enabled video ads to display within the text of my blog. This means that sometimes a video will load in the middle of the a blog post (between paragraphs), and then become “sticky” and play at the bottom of the screen as you scroll down. These ads pay significantly more, since they are much more attention-grabbing, but are also more annoying for readers… so it’s important to find the right balance. I haven’t had any complaints about the ads on my site thus far, so I’m just gunna keep doing what I’m doing! 2. Google Adsense ($5.11) – Oh heyyyy, I beat my record from January by $1! Ballin!! I won’t see this money for quite some time though, since Google Adsense only pays out out when you reach a $100 threshold. Then they direct deposit the money into your bank account. 3. Sovrn ($0.21) – Hehe, okay so this one is the most ridiculous! I should probably just turn this ad network off… I only have it set to display ads in the sidebar, which doesn’t even show up on mobile devices, sooooo that explains my ridiculously low earnings. I also noticed that Sovrn doesn’t have a great fill rate for ads, so more often than not, the space dedicated for this ad is just blank. (Aka there was no good match for an advertising campaign that fits the demographics/traffic of my site). 1. Amazon ($1.27) – Another dollar in the bucket! As I previously mentioned, anyone with a blog or website can sign up to become an Amazon affiliate. Once you have an account, you can generate affiliate links for different products that you talk about or recommend on your website. If one of your readers clicks on the link & purchases anything on Amazon in the following 24 hours, you earn a small commission (usually around 4%). This type of affiliate program probably won’t make you rich, but if you genuinely enjoy certain products, and want to recommend them, it can bring in a few extra bucks (especially if you have a large readership!). Just make you always disclose in your blog post that you are using an affiliate link, to make sure you are in compliance with FTC guidelines & won’t be fined. 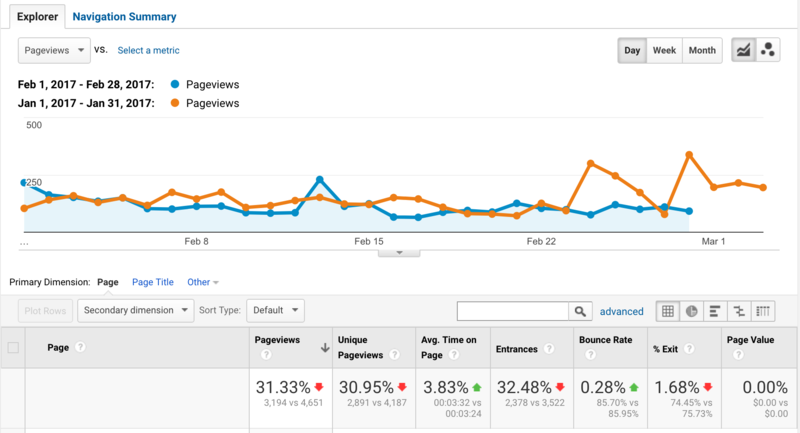 The low traffic is definitely due to the fact that I didn’t post 1 blog post in February. Not one. Because of this, I didn’t get any pops of traffic from new content, and my measly 3,194 pageviews came from old content already out there on the interwebs. Where did this traffic come from?? 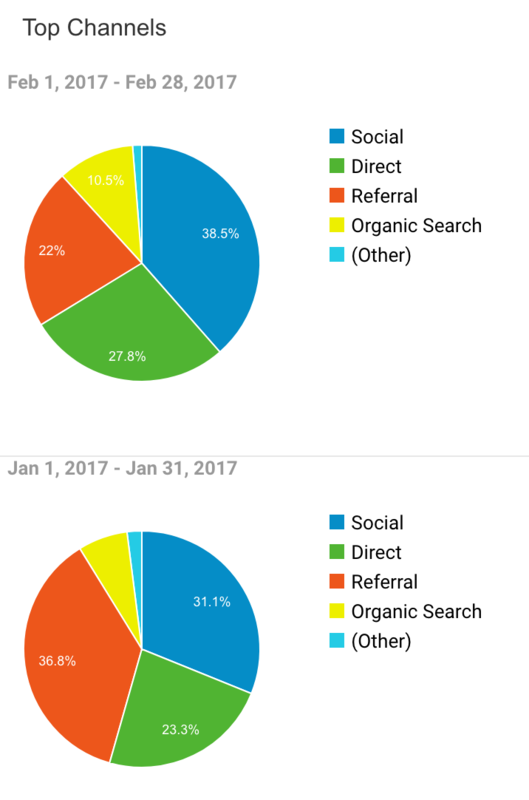 When comparing traffic from Feb vs Jan, you can see that I actually got slightly higher percentages of direct traffic, traffic from social networks, and organic search traffic (that’s aways a plus!). In contrast, I got fewer referrals, likely because I wasn’t posting new content & getting pops of traffic from recipe sharing sites like FoodGawker. Oh well! What was my most popular content? 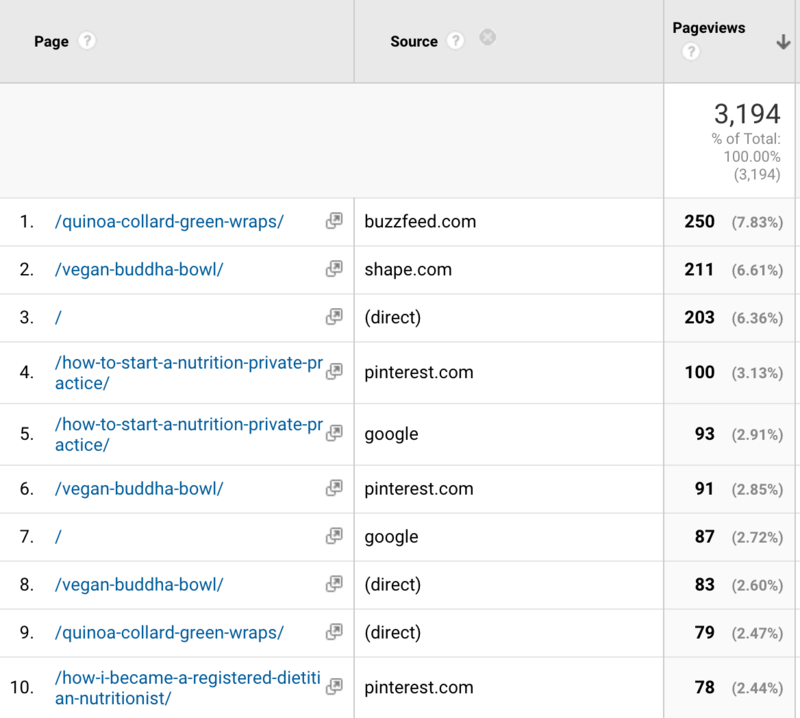 You can see that my most popular post was included on a Buzzfeed roundup, and my second most popular was included in a roundup on Shape.com. This just speaks to the power of including your content in roundup posts! Curious how you can get your recipes shared on other blogs? I recommend joining recipe sharing Facebook groups, such as Dietitians on the Blog or Food Bloggers Central Social Sharing. If you want to get featured on bigger blogs, like Buzzfeed or Huffington Post, it’s probably still worth it to submit to recipe sharing sites like FoodGawker. Some editors still peruse those sites for recipes to include in their roundups. And finally, if you’re a member of Food Blogger Pro (affiliate link), you can submit recipes to roundups on the forum discussion boards! What else was i working on in february? Alright, so if I WASN’T blogging, and WASN’T really seeing a lot of clients in February… what the heck was I doing?? Well, a whole bunch of stuff! 1. I spoke at a conference. I was approached in early 2017 to speak at the 2020 Moms conference, on the connection between diet, inflammation, and perinatal depression. This was an unpaid opportunity, but the topic of the presentation was right in my niche, and I thought it would genuinely be a good opportunity to spread the word about food sensitivities and diet-related inflammation, so I went for it! The conference was held in downtown LA, and although I was invited to attend the full conference, I had a lot of work to do that day, so I attended the speaker before me, and then gave my own 1 hour presentation. Something about speaking really lights me up inside, so it was a really fun and exhilarating way to spend the afternoon! In case you’re wondering, the conference organizers originally found me on HealthProfs, so yet another reason to make sure your online presence is on point. P.S., if you want to see my slides from that talk, you can find them here! 2. I applied for a writing job. Back in February, the website Authority Nutrition was hiring a few nutrition writers for their site. It seemed like a dream job with GREAT pay (like 4 figures per article!!) and the ability to work from home on your own schedule. The application process was actually pretty intense, and involved multiple rounds of applications and custom writing samples. I spent a good chunk of time on these applications because I really wanted the job! Alas, although I made it to the final round of applications, I was not one of the lucky few who was offered a position. Sigh. But it was a good learning experience! I think the #1 thing that worked against me was my lack of experience writing for other publications. 3. I created & narrated my powerpoint for the RD Entrepreneur Symposium. In February I was also approached to be one of the speakers at the first RD Entrepreneur Symposium, hosted by Heather Neal. My topic was the importance of finding your niche, a message I continue to hammer home to this day! I spent a couple days putting together my slides & recording a narration for each one. In the end, I think it turned out great and I had a BLAST connecting with other dietitians at the symposium and in the associated Facebook group. 4. I built this website! I had been mulling over the idea of sharing my “unconventional” RD journey for awhile now… and decided to just DO IT. I basically used the RD Entrepreneur Symposium as a self-imposed deadline for getting this project off the ground. P.S….. if you’ve been mulling an idea over in your head, this is me officially pushing you to do it NOW! Stop waiting! Now is your time!! Okay, so I did A LOT in February, but didn’t make much money from it (yet). After spending most of February NOT really blogging and NOT really seeing many clients, naturally, I planned to re-focus on those things in the coming months. I’ve found that there are natural ebbs and flows in business. This month was a bit of an ebb, income-wise, but I also took the opportunity to work a lot ON my business (not just IN my business), and help propel it forward for the rest of 2017. Well, that’s it for February! I’ll catch you at the next income report! Thank you so much for sharing it ALL! I love having you as a colleague! Great info! Thanks for sharing the nitty gritty so we can all learn from you! I really need to get the virtual counseling going. Looks like that’s the biggest potential! Plus I’m working on some courses and need to finish my book. Some days it feels so overwhelming I don’t even know where to start! Like you, I notice if I don’t post much, my view go down.